L. Cornelius Lentulus & C. Claudius Marcellus. 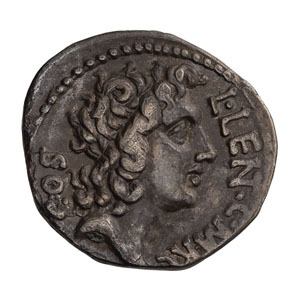 Denarius, 3.82gg. (4h). 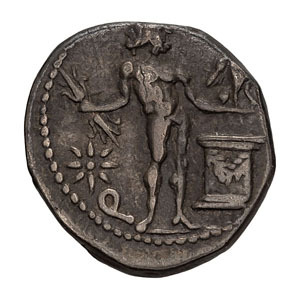 Apollonia, 49 BC. Obv: Head of Apollo right; L LENT C MARC before, COS behind. Rx: Jupiter standing facing, holding thunderbolt and eagle; on right, altar decorated with garland; on left, star and Q.. Crawford 445/2. Sydenham 1030. RSC Cornelia 65. Sear, Imperators 5. Toned VF. Ex Philip T. Ashton Collection. Ex SC Collection.